Cathey Dining Commons’s failure of a health inspection last Tuesday, coupled with Bartlett Commons’s failure of an inspection this Tuesday, has led some students to demand that the administration take action and terminate the University’s contract with food services provider Aramark. A campus-wide e-mail sent on Tuesday stated that while Cathey passed a follow-up inspection after a failure on April 22, Bartlett failed its inspection upon discovery of mouse droppings in the food preparation areas. In the last year, Cathey has failed three out of five health inspections. Bartlett and Pierce each failed once last fall. Upset by the health inspection results, second-year Griffin Burr, who believes Aramark to be the source of the dining issues, started a petition titled “Down with Aramark,” calling for the University to end its contract with the company. The University renewed their multi-year contract with Aramark in 2011. Since its creation a week ago, the petition has already obtained 343 signatures from current students, parents, and at least two incoming students. Several comments alleged a conflict of interest with the contract due to former Aramark CEO Joseph Neubauer’s membership on the University’s Board of Trustees. Neubauer, who stepped down as CEO in 2012, held the position for 29 years and has donated millions of dollars to the University. “We know an Aramark executive sits on the board of directors, and that this particular conflict of interest will result in inaction. We hope that you take the high road, and terminate this corrupt contractual obligation,” one signee wrote. Second-year Hadley Eichengreen, who has been heavily involved with the petition, supports switching to food provider Bon Appétit. 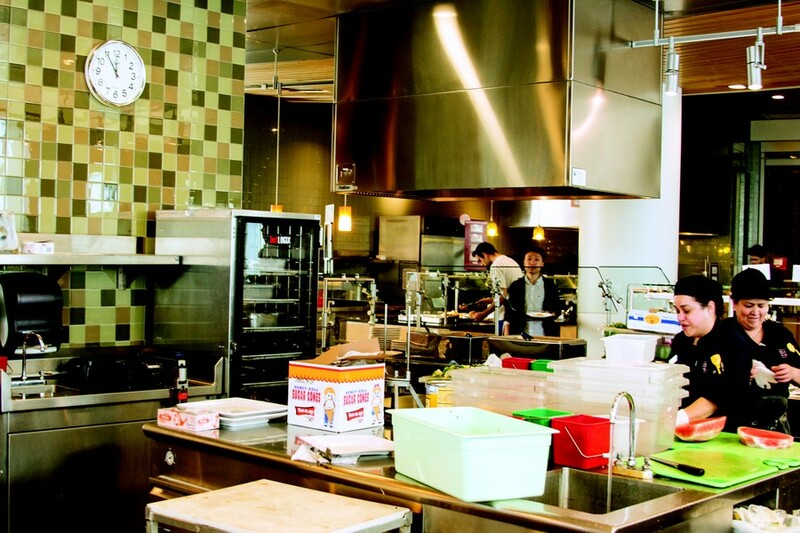 “UPenn recently changed providers from Aramark to Bon Appétit, and Johns Hopkins is also making the switch this summer. Wash U, which is ranked as one of the best colleges in the nation for food, also uses Bon Appétit,” Eichengreen said. Burr also created a Facebook group named “UChicago: Where Good Food Comes to Die,” which has gained 1,065 members since its creation one week ago. Burr said the page was inspired by what he considers a lack of response by the University to student concerns expressed via e-mails and phone calls. Students have posted pictures on the page ranging from insects in their food to dirty plates and silverware. “We’re dissatisfied with the response more than anything. It’s as if they’re apathetic about the whole situation,” Burr said. “I’ve tried calling the administration, and I emailed them four times.” Burr contacted Interim Associate Dean of Students in the University and Director of Undergraduate Student Housing Ana Campos, University President Robert Zimmer, Dean of Students in the College Susan Art, Dean Boyer, Vice President for Campus Life and Student Services Karen Warren Coleman, and Dean of College Admissions James Nondorf. Second-year Ezgi Cubukcu, an SG Committee Member on the Campus Dining Advisory Board, acknowledged the gravity of the situation but pointed out flaws with the Facebook group. Burr and Eichengreen attributed their decisions to move off-campus next year to the poor dining conditions. Fifty-five percent of students live in on-campus housing, according to University spokesperson Jeremy Manier. “For how expensive the meal plan is, cooking for myself would be much cheaper and better. It’s one of the main reasons I’m leaving housing. At the very least, the meal plan shouldn’t be required for most people in housing,” Eichengreen said. At an open meeting Wednesday night to which students were invited to discuss the issue, Richard Mason spoke with College Council regarding their search for an external health inspector. This search began autumn quarter after Cathey failed two inspections in one week. Mason said that he could not comment on the possibility of replacing Aramark with another food service provider.